Rocks along this route were formed in deep marine environments during the Middle Eocene. Most of them are sandstones, marlstones and limestones.. 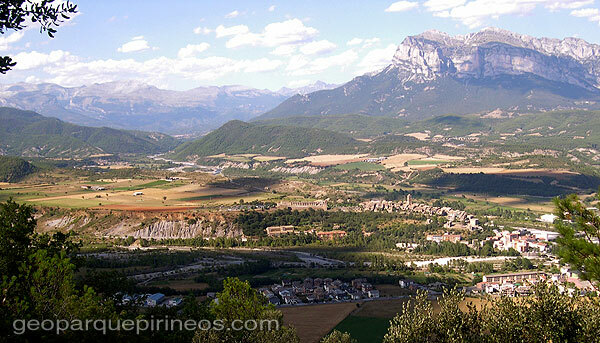 Some mountains, such as El Turbón, were raised by the effect of big mantle landslides, faults, etc. that formed the Pyrenees. 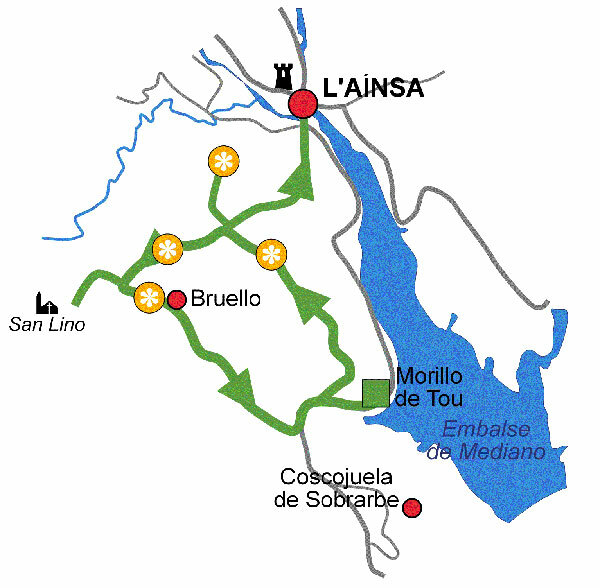 The next point on the route V.9.2 is a viewpoint over the confluence of the Ara and Cinca rivers in Aínsa. Rivers transport myriads of compounds in solution from the rocks they pass through, so every confluence changes the chemical composition of the main river. Near the Cruceta de Bruello we find some sandstone layers with a strong dip. This dip and the flagstones are the main reasons for the difficult descent of the track. .
OOn the plain, some marks in the sandstone make us wonder about their origin: Sedimentary or biological? Route map highlighting the points of geological interest along Route 9. Morillo de Tou-Cruceta de Bruello-Bruello-Morillo de Tou.